A powerful earthquake shook the Philippines at dawn today, wrecking houses, injuring hundreds of people and forcing thousands more to flee for fear of tidal waves. 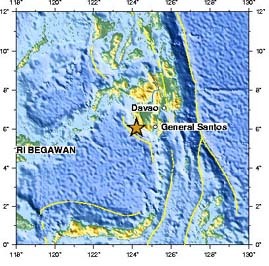 The magnitude-7.5 earthquake occurred about 75 miles west of General Santos on the southern Philippine island of Mindanao. The Philippines Institute of Volcanology and Seismology reports the epicenter was located in the Celebes Sea, with the heaviest damage in the province of Cotabato, about 650 miles southeast of Manila. The tremor is the strongest to hit the Philippines since 1990, when a magnitude-7.7 quake killed more than 1,600 people on the main island of Luzon. Visit the USGS Earthquake Bulletin site for more information.